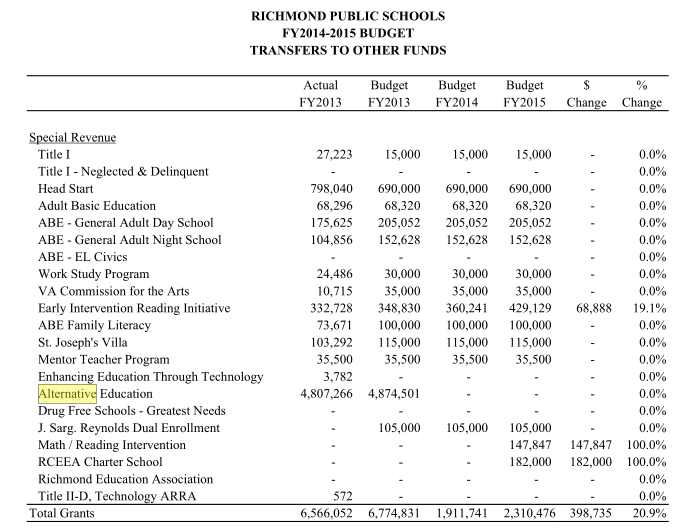 The School Board has just contracted with Camelot Education to run Richmond Alternative School (aka CCP). 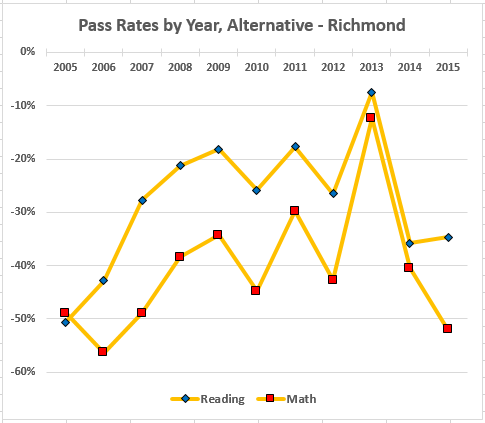 The RT-D quotes Michelle Boyd, our Assistant Superintendent of Exceptional Education (in the Mother Tongue: the Assistant for handicapped kids), for admitting that “test scores in several subjects have been stagnant or have decreased.” Actually it’s much worse than that: Compared to the (already awful) Richmond averages, the CCP scores have collapsed in the last two years. 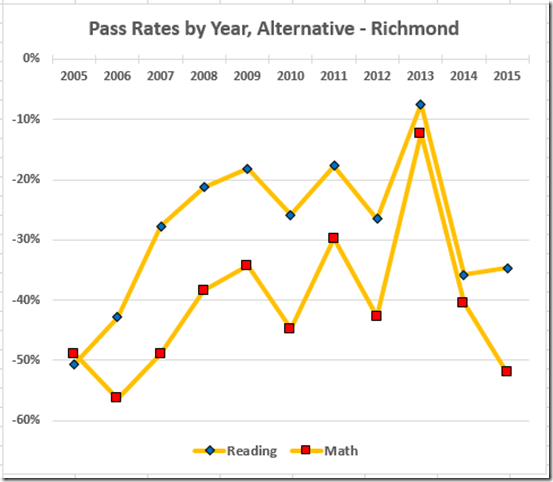 The ordinate there is the Richmond Alternative average pass rate minus the Richmond average. 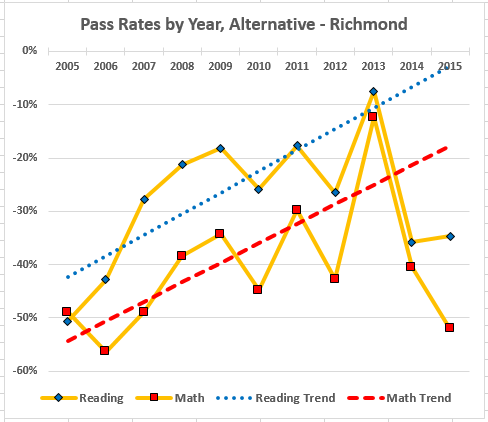 Note that these precipitous drops came after the 2012 and 2013 drops statewide (and plunges in Richmond) caused by the new math and reading tests. 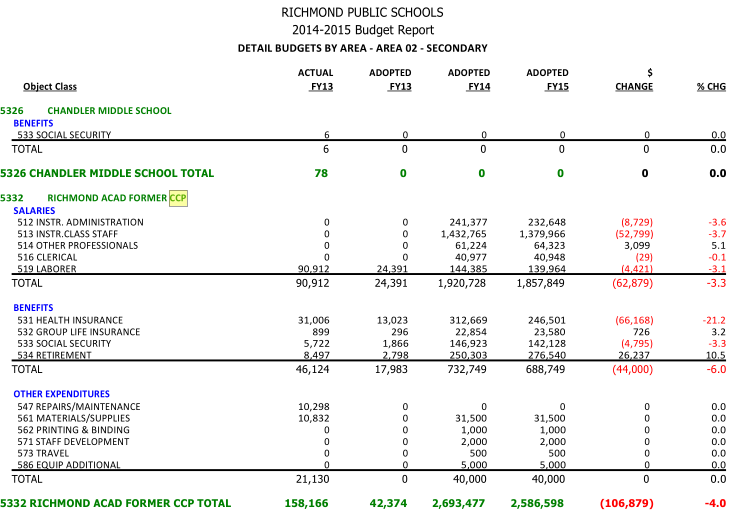 If we fit least squares lines to the pre-2014 data, we get an even clearer picture of Richmond’s inability to operate its own school that the contractor had been steadily improving. 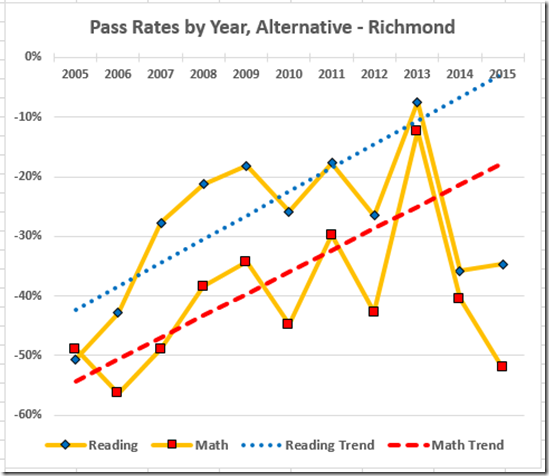 It looks like RPS is a slow learner. 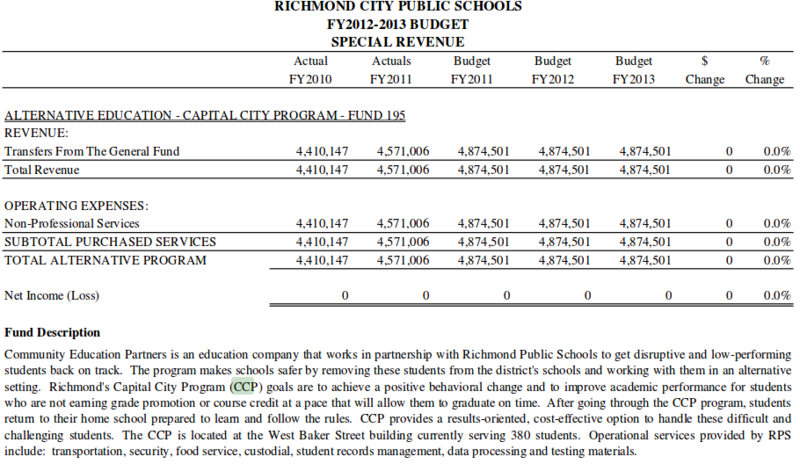 They turned CCP over to the contractor in 2006 because they couldn’t run it successfully themselves. Now, at a price of who knows how many damaged kids, they’ve again demonstrated that they can’t run it successfully themselves. 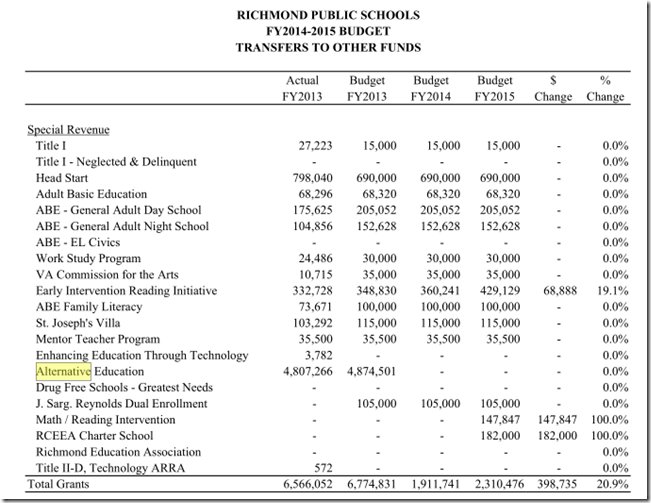 Oh, did I mention that RPS steals the SOL scores of the Maggie Walker students and gives those scores to high schools the students are not attending. 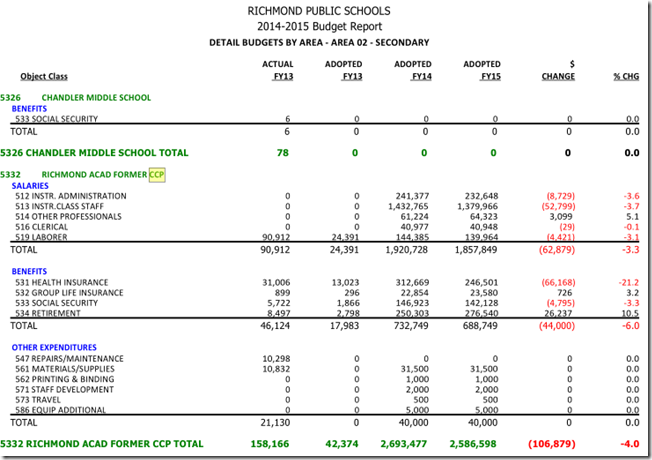 But the middle and high schools get to send their troublesome students to CCP, along with their scores? So, a double lie to improve the scores (not that it has done much good).